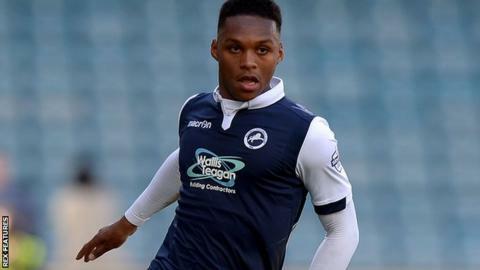 Millwall defender Mahlon Romeo will miss their entire play-off campaign after the Football Association upheld his three-match suspension. The right-back was sent off in Sunday's 2-1 win at Gillingham following a challenge on Brennan Dickenson. The FA rejected Millwall's appeal of wrongful dismissal. Romeo, 20, will miss both legs of the semi-final tie against Bradford and, should the Lions progress, the League One play-off final on 29 May. Millwall face Bradford in the first leg on Sunday, with the return at The Den on Friday, 20 May. Should Neil Harris' side fail to beat the Bantams over two legs, Romeo will miss the opening game of the 2016-17 season.